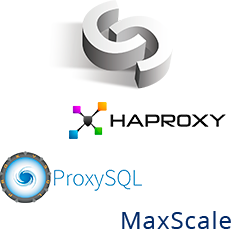 Thanks to everyone who participated in yesterday’s webinar on how to deploy and manage ProxySQL, HAProxy and MaxScale with ClusterControl. Krzysztof Książek, Senior Support Engineer at Severalnines, discussed support for proxies for MySQL HA setups in ClusterControl: how they differ and what their pros and cons are. And he demonstrated how you can easily deploy and manage HAProxy, MaxScale and ProxySQL from ClusterControl during a live demo. If you missed the webinar, would like to watch it again or browse through the slides, it’s all available for viewing online now. You’ll also find below a transcript of the Q&A session, which took place at the end of the webinar. Q.: I’d like to replace HAProxy by ProxySQL - can I deploy ProxySQL on the same VMs as my current HAProxy ones or do I have to create new VMs? I deploy and manage it all with ClusterControl. A.: Yes, as long as there is no conflict in ports used by those two proxies, there’s no reason why they couldn’t coexist. By default there is no such conflict, but a user may customize ports when deploying a proxy from ClusterControl, so if you are not sure how HAProxy is configured, it’s better to double-check it. Q.: Do you know what happened to the admin interface MaxScale 2.0 and why it was removed? A.: We don’t have detailed knowledge - it’s been deprecated due to security reasons, but what exactly is hidden behind this statement, we don’t know. Q.: Have you any plans to talk about or support other load balancers in future, such as F5 BigIP, A10 Networks, or Citrix Netscaler? Or do you have any immediate thoughts on them you can share just now? A.: As of now we don’t have any plans related to these load balancers, but if we get more requests for it, we’ll look into them more. Q.: How can we sync users across multiple Proxysql instances? Or add existing users automatically to a newly added Proxysql instance? A.: As of now, it is not possible to do that using ClusterControl - you still can do it manually, accessing ProxySQL through the command line interface. Having said that, we have plans to implement configuration syncing in one of the next ClusterControl releases. For adding users in batches, right now, CLI is the best way - ProxySQL accepts passwords in a form of MySQL password hash, so it’s fairly easy to write a script which will do the import. This is one of the feature requests we got so we will, most likely, implement it at some point. We can’t share any ETA though. Q.: How does ClusterControl handle configuration changes in ProxySQL? A.: ClusterControl does not take advantage of multiple configuration levels in ProxySQL - any change introduced via the UI is immediately loaded to runtime configuration. Q.: Can you describe what the CPU usage is for ProxySQL or MaxScale on read/write split? A.: Typically you’ll see ProxySQL utilizing less CPU resources compared to MaxScale, but it all depends on your workload and the number of query rules you may have added to ProxySQL.